A PHARMACY customer fought off a career criminal who demanded his cash despite sustaining a “potentially life threatening” injury, a court has heard. Lee Campbell,31, stabbed John O’Flaherty,38, in the chest during a terrifying confrontation outside a chemist’s shop in Calder Road, Edinburgh on December 10 2018. The High Court in Edinburgh heard how Campbell ordered his victim to hand over his wallet. He then stabbed Mr O’Flaherty after he refused. Police investigating the incident discovered Campbell was the man they were looking for. Detectives discovered Campbell had served a four year prison sentence for previously using a knife during a robbery. He also has convictions for assault, theft, and carrying an offensive weapon. The court heard that Mr O’Flaherty, who lives in south Edinburgh, was attacked after he left the McKinnon Pharmacy and was getting into a taxi. Prosecution lawyer Richard Goddard QC told judge Lord Tyre that Campbell believed his victim had money and that he wanted to get his hands on it. “Again the complainer refused. The accused then slid the blade of a knife out of the sleeve of his right arm. “He then struck the complainer with his right hand into the complainer’s left chest area. A struggle then ensued as the complainer sought to ward off the accused. Mr Goddard told the court that Mr O’Flaherty at first though he had been punched and tried to get on with his daily activities. However, he started to have difficulty breathing, started bleeding heavily and was rushed to Edinburgh Royal Infirmary’s High Dependency Unit. Mr Goddard added: “On examination, the complainer suffered a stab injury between his fourth and fifth rub to the left side of his chest. Mr Goddard said medics managed to treat Mr O’Flaherty and he left hospital on December 23 2018. 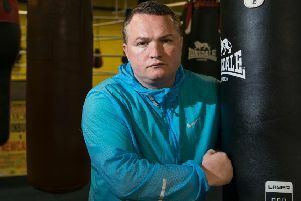 The story emerged after Campbell, a prisoner of HMP Edinburgh, pleaded guilty on Tuesday to assaulting Mr O’Flaherty by demanding his wallet and striking him on the body with a knife. Prosecutors say Campbell’s actions severely injured Mr O’Flaherty, permanently disfigured him and was a “danger” to his life. Lord Tyre deferred sentence on Campbell so he could obtain reports about his character. Campbell will be sentenced at the High Court in Edinburgh on April 24 2019.